Tonight’s episode looks like it is going to be a great season 10 episode 1, so be sure to tune in for our coverage of NBC’s American Ninja Warrior at 9 PM – 11 PM ET! While you wait for our American Ninja Warrior recap make sure to check out all our American Ninja Warrior news, spoilers, recaps & more! 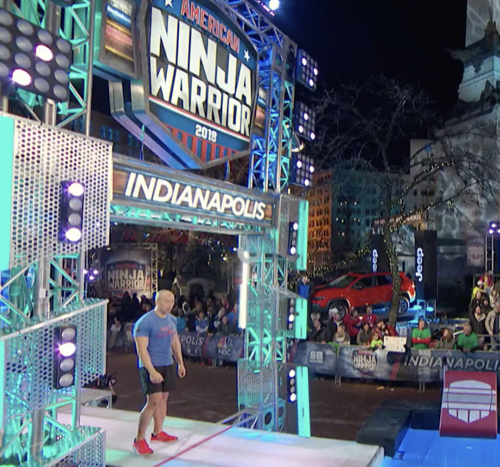 “American Ninja Warrior” was in Indianapolis on tonight’s all new episode. This particular qualifier was unique because he went around Monument Circle which meant it was actual circular. The contestants would all have to run a much trickier obstacle course and to make matters even more difficult there were several new obstacles. There was the Floating Steps, the Cannonball Drop, the new one called the Wheel Flip, the Block Run, another newbie called the Spin Hopper, and that was followed by the dreaded Warped Wall. There were still two options of the Warped Wall and one carried an automatic ten thousand however it limits how much each contestant could try going up either of the Warped Walls. The minor one carried a near limitless tries and the Major Wall meant one try on each. And that’s why many have tried to go after the Minor Wall. That is if they at least make it to the Warped Wall! The first ninja up was Derrick Pavoni who earned the nickname the “Pizza” Ninja. He worked at his family pizzeria and his family were also seen handing out pizza to everyone in the crowd, so it should have been a great night for Derrick. He started the course still eating pizza and unfortunately he began to struggle right away. He struggled with getting off the Floating Steps and had gone on to fall on the Cannonball Drop. Derrick was over much sooner than everyone had believed and that disappointment is going to sting for a while. The next competitor to take on this course was Bill Westrick. He was fifty and had just received a knee replacement. And still he managed to make it past the obstacle and didn’t fall until he was on the fourth obstacle. The Block Run took out Bill and it would go on to take out Jody Avila. He was nicknamed “Big Dog” Ninja for the way he tackled the course the last time and it was his height that worked against him this time. Jody was super tall and that proved to be his downfall on the Block Run. The Block Run requires the competitor to move quick and in small steps which is hard for a taller man. Tall men tend to take great strides and that caused Jody to fall tonight. For a while it hadn’t seemed like anyone would make it past those blocks and the first one that did just that happened to be a woman known for falling on the second obstacle. Nicole Martinez was a PE teacher and twice she had made it to the qualifier only to fall on the second obstacle. She could have done that again this year and she didn’t because she went further than anyone before her. Nicole made it past the second obstacle and managed to tackle the Block Run. She was doing so well until she went up against the Spin Hopper. It sapped whatever strength she had left after the others and she fell though not before securing her place in the City Finals. Now, the ninja that went after her was Brandon Mears. He was a firefighter that was part of a duo team with Dan Polizzi. The two men trained together and very recently they changed things up to include Brandon brand new baby. He became a first-time father last year and raising child on top of a full-time job and ninja training meant the guys had to get creative. They included the baby in their training and had brought along for everything. It had been tough and Brandon had hoped it would be enough, but he too fell on the Block Run and so aspirations for the dream team came down to just Dan. Dan would have his run later on in the show and so up next was Kyle Stradtman. He was known as the “Dog Walking” Ninja because his best friend who also happened to be his dog helped saved his life. He started drinking at 16 and it led him down the wrong path that could have ruined his life. The fact it didn’t was something he accredited to his dog. Kyle got his life together and he needed his job so he again took inspiration from his dog. He became a dog walker and used his experience in running after dogs to train. And Kyle proved to be the hero of the night. Kyle used quick pace to overcome most of the obstacles and he managed to hold on even when it looked like he might fall on the Spin Hopper. So not only did Kyle become the first person to make it to the Warped Wall, he was also first person to finish the course after making it up the 14 ½ Warped Wall. Kyle had been impressive and it remained impressive even as several more tried out with not a single one making it past the Spin Hopper. But hopes were high for Josh Butler. He made it to the City Finals last time as a rookie and this time around he had bigger support group. Josh and his wife had lost a child under unfortunate circumstances and what helped them heal following that ordeal had been their decision to adopt. They adopted their youngest son first because he had been abandoned at a hospital and afterwards they went on to adopt trio of siblings that took their family of three to a family out of six instantly. Josh and the work both he and his wife do was even featured during a morning show. They raised awareness and were quite active in their community, so everyone was rooting for Josh and everyone felt it when he fell on the Block Run. It will all depend on timing whether he makes it to the City Finals and so he wont know where he stands until at the very end. The next ninja that went up was Travis Rosen. He’s made it to the City Finals every time he’s been on the show and everyone wondered if tonight would be lucky number nine. He started the obstacle course strong and he didn’t have the perfect landing after making it past the Block Run yet he made it past and he went on to make it past the Spin Hopper. And so it had seemed like his run would end with him making it up the Mega Wall and sadly he didn’t make it. Travis lost some traction on his way up and missed out on that ten thousand dollars. He did however make it up the 14 ½ ft one and so he might just get to leave out his dream of one day competing with his son. Now until that day comes, the show introduced Tyler Yamamuchi. He was a Physical Therapist and had a great year last year when he made it to Stage 2. He had a great run this time as well when he raced through most of the obstacles and was even daring to race through the Spin Hopper when he made one crucial mistake. He let one hand drop to one side and that tipped over the whole thing. He too would have to wait to see if he made it through to the City Finals! The next ninja that went up was James Wilson otherwise known as the “Nati” Ninja because he hails from Cincinnati where he runs his own Ninja gym. James also had a great run and it ended abruptly when he fell on the Spin Hopper. That Spin Hopper was taking out some of the best and that included seven-time veteran Brian Arnold. The next ninja to defeat that thing and make it to the Warped Walls had been Chris Digangi. He become the third person of the night to complete this difficult course and it was about halfway through by that point, so this course was knocking out some of the best. The next contestant to give this course a try was Indy 500 champion Scott Dixon. He’s watched from the sidelines whenever a teammate has tackled the course and thought it was time to give it a try. Scott made it to the 3rd obstacle when he fell and he said that if he ever came back that he would try much harder. The next ninja that followed Scott was other half of the Towers of Power. Dan Polizzi’s training partner Brandon had fallen on the Block Run and so he redeemed the Towers of Power when he went on to complete the obstacle course as the fourth person of the night. He had been one of the few to try their hand at that 18 ft Warped Wall and had to make do with the 14 ½ when he hadn’t made it to the buzzer on his first try. The next ninja to complete his run was Michael Bougher and he too tried to go after that Mega Warped Wall. He hadn’t made it and had had to press the buzzer after making it up the minor Wall, but Michael did finish with the fastest time of the night. Both men had done well for themselves and they were followed by the legendary Jimmy Choi. Jimmy Choi suffered from Parkinson’s disease and he refused to let that stop him from going after the ninja title. Jimmy had begun strong tonight and he sometimes waited until his hands were shaking just a lit less before he moved yet that’s not what caused him to fall. He fell on the Wheel Flip because he jumped on the trampoline at the wrong place and so despite not being able to go ahead – he was still inspirational. There were two other ninjas that finished the course between Jimmy and a certain someone, they were Phillip “the Bearded Ninja” Hucke and Rigel “the Wavy Hair Ninja” Henry. Neither of whom managed to conquer the Mega Warped Wall and so hopes were once again high when it was Jesse “Flex” Labreck’s turn. She usually placed where her boyfriend Chris DiGangi placed and so she wanted to one-up him tonight by taking on the Mega Warped Wall. Jesse didn’t make it up the Mega wall and had finished the course on the smaller one, but she was the second woman to complete the course this year and so she’ll always have that. The ninja that followed Jesse on the other hand was coming back after a three year hiatus. Isaac Caldiero is the only man to win a million dollars on the show and he was back to once again proved he was the ultimate American Ninja Warrior. He started strong and at times was joking around on the obstacles. Isaac sure had a laugh on the Spin Hopper and he too wanted to be able to make it up the Mega Warped Wall. And so it surprised everyone when he proved to be human. He didn’t make it up that Mega and instead finished his impressive run on the minor one, but everyone knows that he wants to go after that 18 ft monstrosity the next chance he got.